Hello lovely Savor Home readers! I'm Emily from Recently and I'll be your guest blogger of the day. To say I'm happy to be here is an understatement. 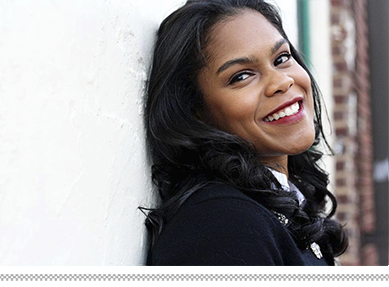 I've quickly come to adore Tiffany and her beautiful blog, so when she asked me to fill in I was honored! Let's get down to business, shall we?? First, have you seen this picture yet? I saw it not too long ago at Bijou and Boheme, and I felt an instant connection. The room is from Sam Allen Interiors, and it was love at first sight! Since I love this look so very much, I want to show you how to recreate it for yourself. I found a very cost-effective table at CB2, and this pouf on Amazon. 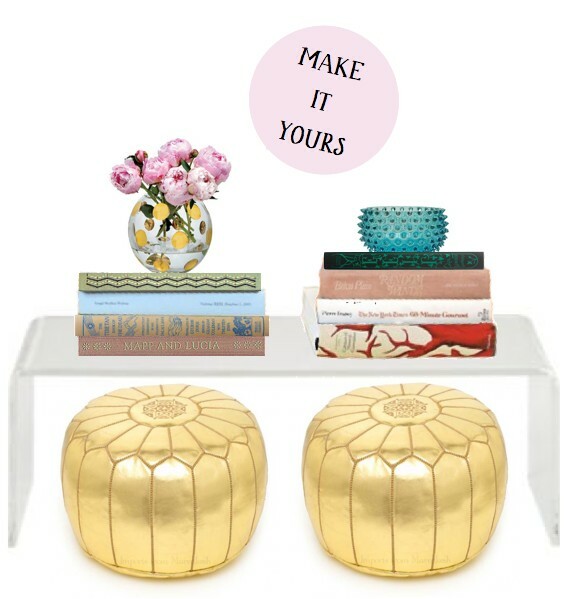 (Tiffany also featured a gold pouf last week that I know would be an excellent choice.) You also might want to try Etsy, Ebay or your local resale shops to see if you can score an even better deal! Once you've found the main pieces, gather your favorite accessories and books, and get to work making this look your own! What do you think? Do you love it as much as I do? I'm saving my pennies for the table and poufs, because I see this as a look that can transition me through many years to come. Tiffany, thank you so very much for having me today! I loved every minute of it! Love this idea and you know I love the gold!! Thank you Emily! Be sure to stop by Emily's blog to see more!! It's a classic look - so fresh and glam. 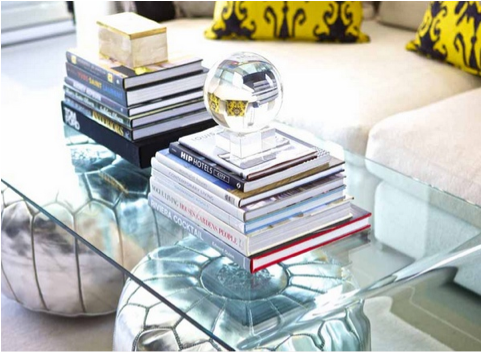 Lucite or glass - both are fabulous for coffee tables. And a bit of gold is always a good thing in my book! What a GREAT post, I love Emily! This is genius! This look is perfection, and I really can't wait to get a Moroccan pouf, is probably going to be my first purchase when I get back home! So happy to be your guest today Tiffany! Thanks again for having me! So happy to have found you via Tiffany's blog. Such a fun guest post! And oh my word those poufs and the table.....must get this look in my living room! I totally want one of those poufs! They are so so pretty...the gold is key. Love this! What a great way to make that picture your own. Great job Emily! What a cool concept! I've never seen poufs stored/used in that way. Great blog post. Fun to discover your site! Hey Emily! 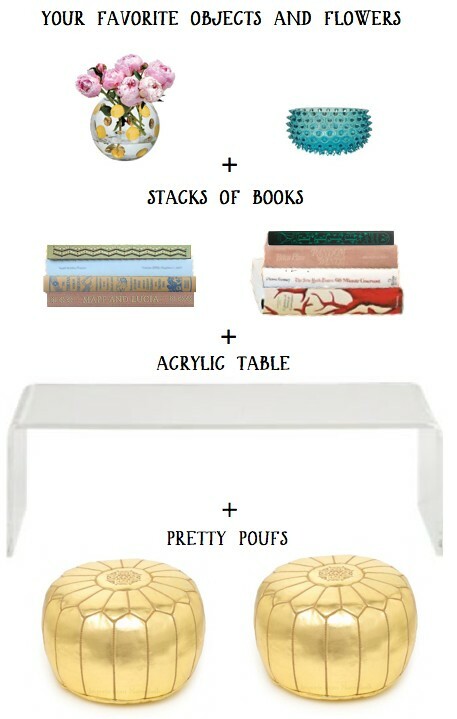 Great post :) I love it when poufs are used the right way! Emily's blog is wonderful. Her blog became and immediate favorite. Her posts are always on-point. She did it again with this guest post. She's good!